Listen the Quran automatically at a specific time. You can manually set the Prayer times according to your Masjid and you will listen the Athan (Azan) automatically five times a day. Read Quran in Uthmani font. More than 15 Quran Reciters. More than 25 Athan (Azan) Reciters. More than 16 Quran Translations. 99 Names of Allah with English translation and transliteration. Listen Quran Recitation online from many famous Quran Reciters. 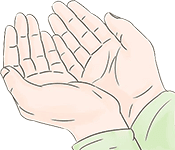 Read and Memorize the Supplications (Dua) Online.